5. Now you just run the app and pick a game to play. 1. Download the free version of Alcohol (52%) from: http://mirror1.free-downloads.net/3/Alcohol52_FE_1.9.6.5429.exe. 2. Put your original Playstation CD into your CD/DVD drive of your computer. 3. Open Alcohol 52% and click “Image Making Wizard” on the left. 4. Check the box that says “Read Sub-Channel Data from current disc”. 5. From the Datatype drop-down list, select “Play Station”. 6. In the Image Name box, enter the name of the game. This will be the name of your .iso file. 7. From the drop-down list on the right, choose “CloneCD Image File”. 8. Finally, choose a place to save the .iso file in the folder selector, and click start. These ROMs can be very large so here is some instructions on how to upload files using USB instead of SSH & Wifi. This is a guide for PC users. This is possible for Mac users as well, but requires Erica’s Macintosh tools. 4. Run Total Commander and go to “Configuration/Options” in the file menu. Select “Plugins” and then click the “WFX” menu button. “ADD” the t-pot’s .wfx file. You will need to unzip the original file t-pot file we downloaded. You will need to restart Total Commander for the plug-in to work. 5. Connect the iPhone via USB. 6. 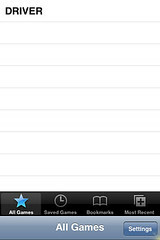 At the top of the two window panes is a drop down menu usually labeled [-c-]. Select Network Neighborhood [–] from it. Choose t-pot from the window pane. Now you can see all your files on the iPhone and you are connected. Just drag and drop! If you need more help with psx4all there is a FAQs at http://zodttd.com/wp/?page_id=2. hey, i tried this with my own game Rapid Racer. I did everything as you said in the instructions, and when i go on the app and click on rapid racer to start, first a little BIOS not found thing comes up but after 2 seconds it goes, then it goes onto like something that i can see half a screen off, it sais like ”the unauthorised …… blah blah which i cant see becuase i can see only half the screen, and it stays like that, it doesnt go onto the game! i think when you actually play the game on the playstation that thing comes up warning about piracy only for like a minute then goes onto the game, but here nothing happens even as i click on all the button! Yeah…that is bound to happen since this is the first release of this app. Some of the games just don’t work yet…hopefully we will continue to see updates. For now, I would check out the developer’s f.a.q. at http://zodttd.com/wp/?page_id=2. yes i sorted it out now, and it does work! wohoo but 10x slower than the actual game speed which is a killer, im tryin some other games i have to see if any are better! I’m glad you got it all sorted out…what did you have to do to fix it? And…all the games I have tried are really slow too!! It’s enough to drive you crazy! Just upload it to the /Applications folder and set it’s permissions to 0755. I don’t think iBrickr allows you to change permissions…you will need to use another program like WinSCP. Well in like gpsphone can you speed up the gameplay? The same…Ive used Squid to remove write protection…but it is still asking the bios. the first thing is make sure the bios is all in lowercase, even the file extension. I realised mine wouldn’t work, but once I changed it into all lowercase, it doesn’t make noise anymore. that will make the bios file having a permission of 755.
i hope this helps all of you other there. take care! 1) If you use ibrickr , copy the file to /Applications/psx4all folder . Hello… I need some help.. I have the 1.1.3 firmware and I dont have the /Applications folder… Where I must create it to work?! 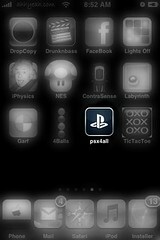 I have manually installed the psx4all.app into my iphone. Then I dowload the scph1001.bin and set the permission to 0755. After I reboot my iphone I can see the psx4all icon. Then after I click on it, it came up with a white screen. Then after 30 sec, it went back to my main screen. I have search the web for two days and could not find any help on this problem. I wounder any one can help me out? PLEASE! 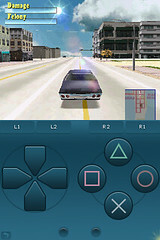 this whole trying to play psx games on iphone is lame. i can’t find any rom sites for iso roms. if i do, they don’t work with the emulator. zodtt has released a new version that is supposed to support 1.1.4, but when you go to the site there is no mention. 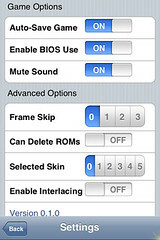 just 1.1.3. he also does not mention if you need the bios with the new version. he just says he moved it. very confusing zodtt. Hi! i have already fixed that bios thing and all but i have this small problem. The game starts playing but it stops after few seconds ??? please help me!!! This emulator needs a lot of work done to it so the games can run smoother and compatibility needs to be worked on. I have tried Final Fantasy IX and VIII and both of them when they reach the beginning CGI they stay at a black screen and nothing happens, only the menu works. and there is no way to skip this, so annoying. Anybody knows how to disable the memory checking ? I was trying to play *blaze and blade*, by the way. where do you upload the bios? Can anyone please tell me that what is the name of the iphone theme displayed above ? In this 5-minute video, Ben offers presents customers to the CEP coaching. Most folk have to see what to do, somewhat than read about it. Due to this, Ben has made top quality movies to accompany his ebook. Ben understands the demand for a schedule that is good when understanding, which is why he’s included worksheets alongside his software to the make things less difficult. You’ll only be able to add as a lot muscle as your physique can deal with. I am getting familiarity daily by reading thes good articles or reviews. your augment and even I achievement yyou get entry to persistently fast. for to keep it wise. I can not wait to learn far more from you. The encryption option can be traced from the following location:. simultaneously while doing other activities side by side, by simply pressing the left corner button plus lots of new options that will definitely attract your attention. New Themes Added – YAY!